UNITED NATIONS — Days after U.S. President Donald Trump denounced globalism before world leaders at the United Nations, China and Russia positioned themselves Friday as defenders of internationalism that are keeping promises when Washington is backing away from them. Lavrov and Wang were hardly the only leaders to defend the concept of multilateralism at this week’s U.N. gathering. Taking up the mantle of multilateralism isn’t without self-interest for Russia and China. The U.N., for instance, gives them a forum to drive events in their interest and block moves they oppose by the U.S. and other Western countries. 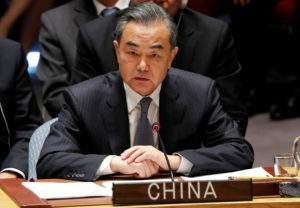 Russia and China both have veto power on the powerful Security Council and have used it in recent years against measures on such issues as the use of chemical weapons in Syria, which counts Russia as a close ally. The U.S. also has used its veto recently. “State-to-state relations must be based on credibility, not on willful revocation of commitments,” he said. Wang highlighted China’s massive economy as a major contributor to global growth. He described his country’s trade policies as defending not just its own interests but the system of global economic exchange. Most other nations challenge China’s assertions that it’s a defender of free trade. China has come under increased criticism as its global profile has risen and its economic interests — and accompanying political clout — have spread from Asia to Africa, Latin America and the Middle East. Besides China’s clash with the Trump administration, some Africans have protested what they say is an attempted Chinese takeover of their countries. The Trump administration alleges that China steals U.S. trade secrets and forces American companies to hand over technology in exchange for access to the Chinese market. China has accused the Trump administration of bullying. China has been asserting itself on the world stage, though it continually stands by a foreign policy of noninterference in the affairs of other countries. Trump stunned members of the Security Council on Wednesday by saying that China was meddling in the midterm elections because it opposes his tough trade policies. He later said there was “plenty” of evidence but didn’t immediately provide it. Beijing was quick to respond, urging Washington to stop slandering China and claiming that the Chinese government does not interfere in other countries’ internal affairs. Wang didn’t address the election-meddling claim Friday. Other countries, including some of Washington’s allies, also appealed at the General Assembly on Friday for preserving the framework of multinational collaboration. “Action based solely on nationalism, with the objective of putting ‘my country first,’ reaches its limits here — not least because our climate knows no borders,” said German Foreign Minister Heiko Maas. He noted that his country is standing by the Paris accord to tackle global warming — an agreement Trump has announced the U.S. will withdraw from unless it gets a better deal. Iraqi Foreign Minister Ibrahim al-Jaafari, meanwhile, thanked the international community and the U.N. for its help in fighting the Islamic State extremist group. He said “a new era in Iraq’s story” is beginning after years of war and turmoil. Malaysian Prime Minister Mahathir Mohamad offered a personal perspective on how the international order is faring. Now 93, he returned to politics this year after retiring in 2003. And it hasn’t been found, he said. Associated Press writers Angela Charlton, Matthew Pennington and Edith M. Lederer contributed.